Single Girl Gourmet: What size instant pot should you buy? So, you've decided to buy an instant pot but you are unsure of what size to get. This is a common question when considering to buy an electric pressure cooker. I am here to help you! There are 3 sizes of current models being sold 3qt, 6qt and 8qt. There was previously a 5qt size available and you might still find it if you buy a second hand one. I haven't seen it sold online since summer 2017 and even then I think it was retailers clearing out their stocks. Only the duo model is sold in the mini size. The name "mini" should be your clue here, this is the smallest size. In my opinion, this size is best for making side dishes, or perhaps cooking for 1 person (even then I'd recommend the 6qt). If you already have a large IP and you love it, you might want to add a mini to your arsenal. This is the size I personally own (family size of 2 adults) and I would recommend this size for most smaller households (1-3 people). For small households you can cook with plenty of leftovers and batch cook in this size. This size can also work for larger households (4-6 people) if you prefer not to have many leftovers and don't batch cook. I would actually also recommend this size for those only cooking for 1 person because even though it will take up more room, there will be times when you want to cook more or do PIP which would be difficult in the mini. The 8 quart is best for cooking in large batches or if you have a larger family (4+ people). Keep in mind that the base of the IP is fairly large and this bad boy will take up a fair amount of counter space. I do personally know one couple without kids who bought the 8 quart because they wanted to be able to batch cook and have the extra space for holiday gatherings. The GEM is not a pressure cooker. 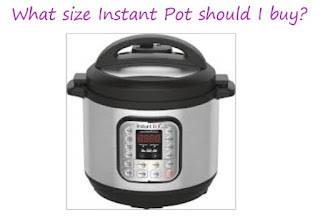 I repeat, this model of “instant pot” is not a pressure cooker. It is made by the same company and has confused many hopeful pressure cookers who saw the brand name and thought it would pressure cook. The GEM is a “multi-cooker” and can be used to slow cook, roast, stew and sear/sauté. If you like recipes where you sear the meat and then slow cook the GEM would be great for that because you can do both with the same appliance but it’s not a pressure cooker. Are you a newbie? Tell us in the comments what your concerns are! This post contains some affiliate links, if you make a purchase with these links this blog will receive a small commission. Thank you for your support.